Former President Ferdinand Marcos died in exile in 1989, three years after fleeing the country. This gave the Philippine government three years to criminally prosecute the ousted dictator for his crimes against the Filipino people. However, there is no record that Marcos had been criminally convicted. Former Supreme Court Associate Justice Abraham Sarmiento considers Marcos’ death outside the country as leaving him “unpunished” for his crimes. “I feel the ex-President’s death abroad (presented in the dailies as ‘imminent’) would leave him ‘unpunished’ for his crimes to country and countrymen. If punishment is due, let this leadership inflict it. But let him stand trial and accord him due process,” Sarmiento said in his dissenting opinion on the SC decision to bar Marcos from returning from his Hawaii exile to return to the country to die. Marcos’ successor, former President Corazon Aquino, instead created an agency that would go after the Marcos family’s ill-gotten wealth. Various courts in four countries have ruled that at least .6 billion worth of Marcos properties were ill-gotten. The Philippines was able to recover Marcos diaries and documents in Malacañang when the family fled Manila on February 25, 1986. Such documents revealed the existence of secret bank accounts in Switzerland. The first couple used false identities in opening their first ever bank account with Credit Suisse in Zurich—”William Saunders” for the former president and “Jane Ryan” for his wife Imelda in 1968, four years before the declaration of Martial Law in the Philippines. The presidential salary then was around $5,600, yet his Swiss bank account had a balance of $950,000. 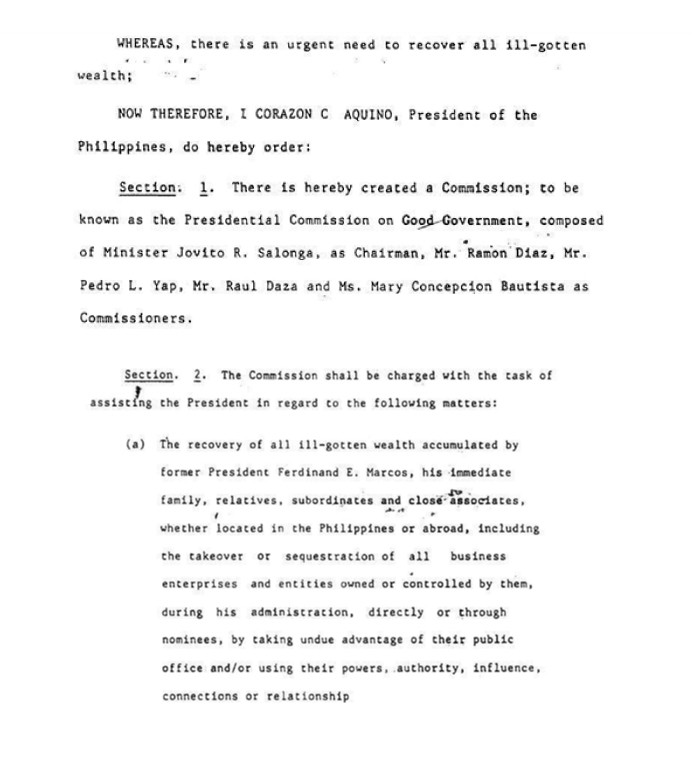 In 1986 when Marcos was deposed, the first law that Corazon Aquino signed created the Presidential Commission on Good Government (PCGG), mandating it to recover all ill-gotten wealth accumulated by ousted dictator, his immediate family, relatives, subordinates and close associates in the Philippines or abroad. Since its establishment, the agency has recovered at least P170 billion (nearly $3.6 billion) in cash. In an article titled “Recovery of the Marcos Assets,” former PCGG Commissioner Jaime Bautista recalls that the William Saunders-Jane Ryan accounts were closed by 1970 but its balances were transferred to the Xandy Foundation, which was later transferred to Fides Trust Co. and then to Avertina Foundation. This is only one of several foreign foundations that the Marcoses established as supposed cover-up for their money deposited in the Swiss banking system. The Swiss Federal Supreme Court ruled that the secret Marcos account hidden in Swiss banks had criminal provenance. The high court ordered its transfer to the Republic of the Philippines and placed it under escrow with the Philippine National Bank. In 1998, Switzerland turned over to the Philippines bank deposits worth $627 million in accordance with the Swiss Federal Supreme Court. The Marcos foundations appealed to prevent the transfer of bank deposits to the Philippines but the Swiss Federal Supreme Court ruled that the foundations were mere creations of Marcos and that they had participated in his bad faith. In 2014, Singapore’s Court of Appeals ruled in favor of the Philippine National Bank over the $23 million seized from the estate of the late strongman. Singapore’s Straits Times reported that the funds comprised of $16.8 million and £4.2 million formed part of the Swiss bank accounts. “While the court ruled that PNB has legal title to the account, PNB holds the monies in its capacity as a trustee for the Republic pursuant to an escrow agreement with the government,” then PCGG chairman Andres Bautista said. In 1996, the New Jersey Supreme Court ruled that two Marcos-claimed properties belonged to the Philippine government as there was hard evidence that it was purchased with money siphoned from the Philippine treasury. In 1986, the PCGG was able to acquire the award of titles of the Princeton Pike and the Pendleton Drive property, which were sold for P36 million in 1987. A US District Court in Hawaii, where Marcos died in exile, had found his estate liable for torture, summary executions and disappearances, as reported by the New York Times. The Pimentel class of human rights obtained an award of billion for compensatory damages and exemplary damages against Marcos for his personal liability in human rights violations. The Philippine government, however, intervened in this suit and waived Marcos’ personal immunity as formal head of state but did not waive its rights to the ill-gotten wealth. The Marcoses and the complainants reached a compromise in this case, which releases the family from all criminal liability in exchange for payment of million to be taken from the Swiss bank accounts. Anti-graft court Sandiganbayan rejected the compromise agreement as having no statutory or constitutional justification. In 2003, the Philippine Supreme Court granted the forfeiture of the -million Swiss deposits of the Marcoses. 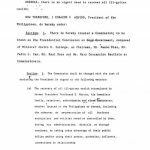 Representing the Philippines, the PCGG filed a petition for forfeiture against Marcos assets under the Forfeiture Law for violations of the Anti-Graft Law. Switzerland acknowledged the validity of the Philippine judgment. The 2003 judgment, however, did not include the Arelma shares. It was only in 2014 that the Supreme Court upheld with the finality the forfeiture of the Panamanian firm Arelma Foundation of the late dictator Ferdinand Marcos which was deposited in the United States. 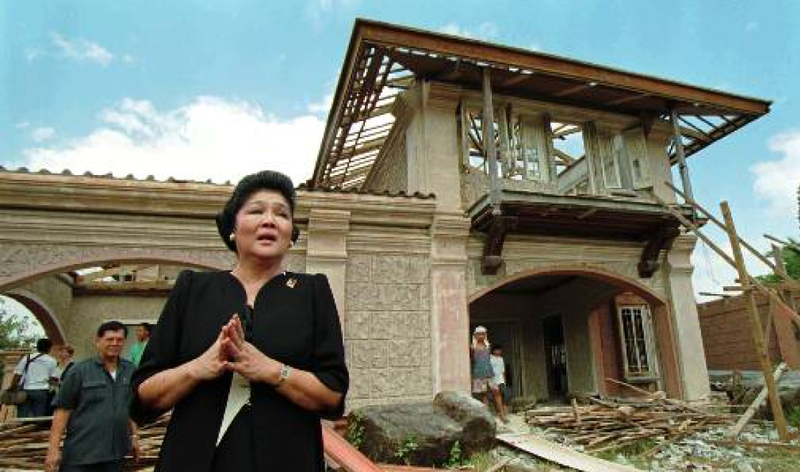 The STAR reported that the high court affirmed its April 2012 decision denying the appeal filed by the heirs of the late strongman — Ilocos Norte Rep. Imelda Marcos and their son Ferdinand “Bongbong” Marcos Jr.
Former First Lady Imelda Marcos visits her sequestered mansion at the posh Dasmarinas Village at suburban Makati which is being renovated by its new owner after being sold by the government commission tasked to recover alleged ill-gotten wealth of the Marcoses, in this Dec. 5, 1994 file photo. Ten years after the “People Power” revolution that ousted the Marcoses from 20 years in power, the government still has to recover bulk of the alleged billions of dollars of Marcos’ assets. The appeal was in connection with the 2009 decision of the Sandiganbayan declaring that all assets, properties and the so-called Arelma funds are among the ill-gotten wealth of the late dictator and should be forfeited in favor of the government.